The Echo Traverse Kit is an angling outfit built for the serious angler. The Echo Traverse Kit comes with a Traverse 4 piece fly rod, an Echo ION reel spooled with backing and airflow premium fly line, and a fabric covered rod/reel case. 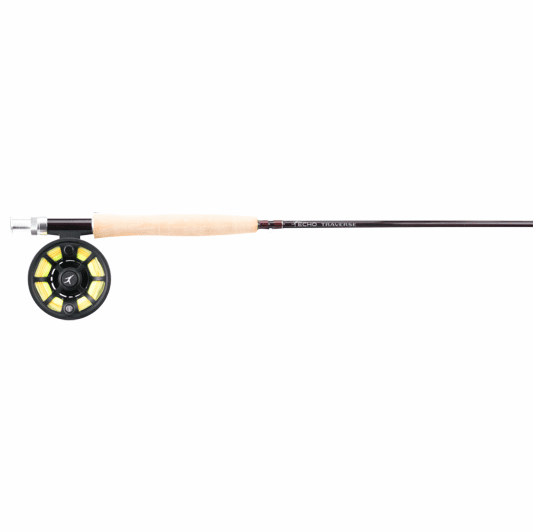 The Echo Traverse Fly Rod is a medium-fast action rod perfect for all trout fishing situations. You can fish dry flies, nymphs, and streamers effectively with the Traverse. It has enough backbone to turn over the heavier flies and assist you in the wind, while the mid-flex medium characteristic allows you to lay a gentle dry fly cast to a spooky fish. All Traverse Rods are 9 feet and break down into 4 pieces. The Echo ION reel has an aluminum construction and a smooth, fully-adjustable drag system. It has a large arbor design for quick line pick up as well. Pre-spooled with backing and Airflo Premium floating fly line, you are ready to hit the water! Just add a leader and a fly. This kit has both the new angler and expert angler in mind. The price is perfect for the introductory fisherman, while the quality is sufficient for anglers of all skill levels. The Traverse Kit comes with a lifetime warranty from Echo.